Department of Accounting, Afe Babalola University, Ado-Ekiti, Nigeria. *To whom correspondence should be addressed. E-mail: afolabiilesanmi@yahoo.com. Received 20 January, 2018; Received in revised form 15 February, 2018; Accepted 20 February, 2018. Information communication technology (ICT), Forensic accounting, Financial reporting. 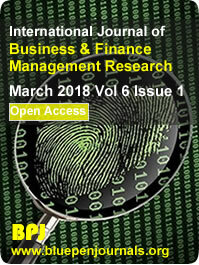 This study examined the impact of information communication technology (ICT) on forensic accounting practice. A survey was designed and carried out using a questionnaire and the data obtained were analyzed using Kolmogorov-Smirnov (K-S) test, percentage analysis and reliability statistics. However, the outcome of the analysis revealed that information technology (IT) based forensic accounting has significant agreement with the speed of detecting fraud with other financial crimes in the process of forensic investigation. It was concluded that IT based forensic accounting would minimize time spent while performing forensic investigation and also bring about accurate evidence as regards financial reporting and other suspected criminal case investigations. It was therefore recommended that firms, companies and most importantly the public sector should have a review of their plans and strategies to capture forensic accounting in a digitalized environment, taking into consideration forensic software as an aid to speedy investigation of fraudulent cases and other criminal offences in order to get more accurate evidence that would support any litigation.